stressed the traditional British teachings of reading, writing, and history. Chisholm credits much of her educational successes to this well-rounded early education. When Chisholm was ten years old, she returned to New York during the height of the Great Depression (1929–39). The Great Depression was a time of severe economic hardship when many people in the United States were unemployed. Life was not easy for the Chisholms in New York, and Shirley's parents sacrificed much for their eight children. Chisholm attended New York public schools and was able to compete well in the mainly white classrooms. She attended Girls' High School in Bedford-Stuyvesant, a section of Brooklyn. Chisholm won tuition scholarships to several distinguished colleges but was unable to afford the room and board. At the urging of her parents she decided to live at home and attend Brooklyn College. While training to be a teacher, Chisholm became active in several campus and community groups. She developed an interest in politics and learned the arts of organizing and fund-raising. Soon, she developed a deep resentment toward the role of women in local politics, which, at the time, consisted mostly of staying in the background and playing a secondary role to their male equals. Through campus politics and her work with the National Association for the Advancement of Colored People (NAACP), an organization that was formed in 1909 to work for equal rights for African Americans, Chisholm found a way to voice her opinions about economic and social structures in a rapidly changing nation. After graduating with honors from Brooklyn College in 1946, Chisholm began work as a nursery school teacher and later as a director of schools for early childhood education. She became politically active with the Democratic Party and quickly developed a reputation as a person who challenged the traditional roles of women, African Americans, and the poor. In 1949, she married Conrad Chisholm, and the couple settled in Brooklyn. During her successful career as a teacher, Chisholm became involved in several organizations including the League of Women Voters and the Seventeenth Assembly District Democratic Club. After a successful career as a teacher, Chisholm decided to run for the New York State Assembly. Her ideals were perfect for the times. In the mid-1960s the civil rights movement was in full swing. Across the nation, activists were working for equal civil rights for all Americans, regardless of race. In 1964 Chisholm was elected to the assembly. During the time that she served in the assembly Chisholm sponsored fifty bills, but only eight of them passed. One of the successful bills she supported provided assistance for poor students to go on to higher education. Another provided employment insurance coverage for personal and domestic employees. Still another bill reversed a law that caused female teachers in New York to lose their tenure (permanence of position) while they were out on maternity leave. Chisholm served in the state assembly until 1968, when she decided to run for the U.S. Congress. Her opponent was the civil rights leader James Farmer (1920–). Chisholm won the election and began a long career in the U.S. House of Representatives, lasting from the Ninety-first through the Ninety-seventh Congress (1969–1982). As a member of Congress, Chisholm attempted to focus her attention on the needs of her constituents (the voters she represented). She served on several House committees including Agriculture, Veterans' Affairs, Rules and Education, and Labor. During the Ninety-first Congress, when she was assigned to the Forestry Committee, she protested her appointment and said that she wanted to work on committees that dealt with issues that were affecting her district. Forestry issues had little or no importance to the people she represented in Bedford-Stuyvesant. With the Vietnam War (1955–75) raging overseas, Chisholm protested the amount of money being spent for the defense budget while social programs suffered. The Vietnam War was a conflict in which South Vietnam, supported by the United States, was fighting against a takeover by the Communist government of North Vietnam. Chisholm argued that money should not be spent for war while many Americans were hungry, poorly educated, and without adequate housing. Chisholm was also a strong supporter of women's rights. Early in her career as a congresswoman, she took a stand on the issue of abortion (a woman's right to prevent the birth of a child) and supported a woman's right to choose. She also spoke against traditional roles for women professionals (including secretaries, teachers, and librarians), arguing that women were capable of entering many other professions. Black women especially, she felt, had been pushed into stereotypical roles, or conventional professions, such as maids and nannies. Chisholm supported the idea that they needed to escape, not just by governmental aid, but also by self-effort. Her antiwar and women's liberation views made Chisholm a popular speaker on college campuses. After her unsuccessful presidential campaign, Chisholm continued to serve in the U.S. House of Representatives for another decade. As a member of the Black Caucus (a group of lawmakers who represent African Americans) she was able to watch black representation in the Congress grow and to welcome other black female congresswomen. In 1982, she announced her retirement from Congress. From 1983 to 1987 Chisholm served as Purington Professor at Mt. Holyoke College in Massachusetts, where she taught politics and women's studies. In 1985 she was the visiting scholar at Spelman College, and in 1987 she retired from teaching altogether. Chisholm continued to be involved in politics by cofounding the National Political Congress of Black Women in 1984. She also worked for the presidential campaigns of Jesse Jackson (1941–) in 1984 and 1988. In 1993 President Bill Clinton nominated Chisholm for the position of Ambassador to Jamaica. Because of declining health, she turned down the nomination. Although Chisholm broke ground as the nation's first black congresswoman and the first black presidential candidate, she has said she would rather be remembered for continuing throughout her life to fight for rights for women and African Americans. Chisholm, Shirley. Unbought and Unbossed. Boston: Houghton Mifflin, 1970. Itzkowitz, Leonore K. Shirley Chisholm for President. 1974. Jackson, Garnet. Shirley Chisholm, Congresswoman. Cleveland: Modern Curriculum Press, 1994. 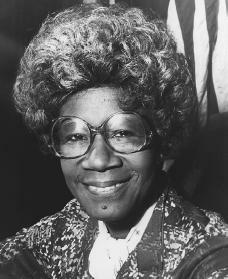 Pollack, Jill S. Shirley Chisholm. New York: F. Watts, 1994. Scheader, Catherine. Shirley Chisholm: Teacher and Congresswoman. Hillsdale, NJ: Enslow, 1990. This is good imformation. Shirley Chisholm did alot of good things. Sunch as, fighting for woman's rights. She is truely my rolemodel and my hero. It would be great if she was still here today. Her life might have been hard, but she surrived it, and did what she believed in. And that's what truely matters, right? Setting goals and succeded them. Shirley Chisholm is such a believer! Thanks for the imformation. PEACE!!! good info about her because i'm doing a project on her. I believe the article was written in great taste and I enjoyed reading it. You all did a beautiful job in compiling your research. I , myself enjoy non-fiction and biographies along with factual information. When I'm in a conversation with someone, I can give them true facts that i have read and not miss information.